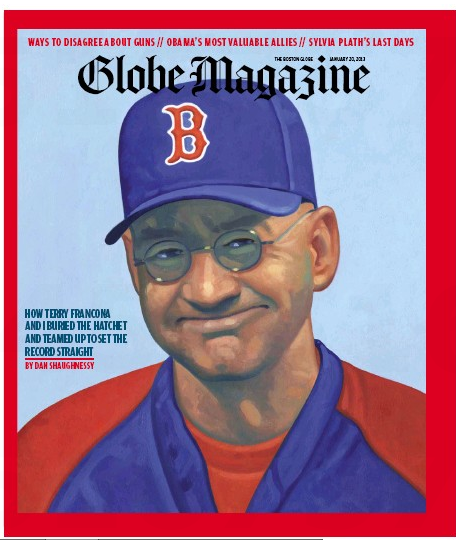 The cover story in the Sunday Boston Globe Magazine features sports columnist Dan Shaughnessy’s promo for his new book on former Red Sox manager Terry Francona. Our writing process was simple and structured. Terry and I would meet, usually in a hotel coffee shop or restaurant. I’d record a couple of hours of conversation, then disappear for a few weeks to write. When a chapter was finished, I’d e-mail it to Terry, and he’d call back with corrections, clarifications, and occasionally a deletion. Fine. Schill is not a blowhard. Not in this book, anyway. And Shaughnessy was not a journalist. Not in this book, anyway. Michael Silverman’s Baseball Notes column in the Sunday Boston Herald reinforced that point. 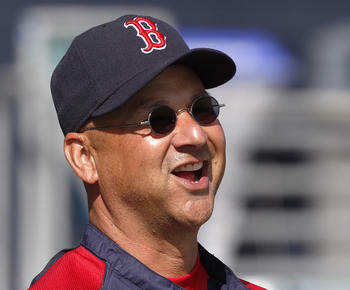 Terry Francona did not set out to hurt anybody’s feelings when he co-wrote a book about his eight years with the Red Sox. If the owners are not happy with their portrayal — and how could they be? — as being more concerned with image than substance and as not loving baseball as much as Francona, the former Sox manager owns up to that. He felt he was being honest, after all. When he was fired or quit in October 2011, his own feelings were hurt. So, without any malice or forethought on his part, it sounds kind of natural to Francona that not everyone is going to be chuckling about how they are portrayed in the book. Anyone besides the hardreading staff mad about that? This entry was posted on Monday, January 21st, 2013 at 6:11 am and is filed under Uncategorized. You can follow any responses to this entry through the RSS 2.0 feed. You can leave a response, or trackback from your own site. Francona was on Weekend Edition on NPR Saturday. He went out of his way to praise clubhouse employees, which is like going out of your way to praise assistant coaches at Penn State. Francona wasn’t with the Red Sox when the sexual abuse was going on, but he had to have heard the story. Or maybe he didn’t. The Red Sox organization, and the Boston media in general, seemed to be making a real effort to look the other way.